If you have ever been diagnosed with ADD or ADHD, called a Nut Case, Wild Man, Psyco, Insane, a Jackass or if you just like to blow stuff up... This is your new home! You are not alone, my name is Kyle Woods and I too have an adrenelin addiction. 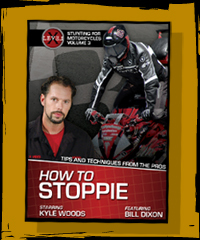 The Long awaited "How to Stoppie DVD" is available now! This DVD has all the info you need to know about Stoppies and Endos. From beginner to pro we teach it all. 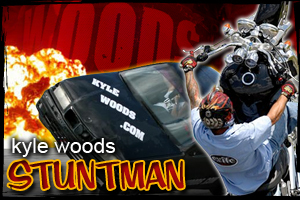 While you're there don't forget to check out the " How to Wheelie" and "Advanced Wheelies" DVD's as well as the best motorcycle stunt DVD's on the market. For Box set pre-order shipping and info please e-mail Levexvideo@aol.com so we can correct your address and get yours out today! A day in the life feature on Kyle Woods.